Acesulfame K is an artificial sweetener that was discovered in 1967. It is also called Acesulfame Potassium. It is approx 200 times sweeter than sugar, though it has a slightly bitter aftertaste. For this reason it is not usually used on its own. However its usefulness is that it tends to produce a good synergistic effect when mixed with other sweeteners. It is often used 40/60 with Aspartame and the two sweeteners tend to cancel out the bitter aftertaste of each other. (Cyclamate is often mixed 90/10 with Saccharin for the same reason.) It is sometimes mixed with other sweeteners. Occasionally it us used on it's own in flavored waters, where a low sweetness is required. It does not break down under high temperatures and so can be used in all processed foods and in cooking. It is in literally thousands of products. Other than as a zero calorie sweetener it has no other use. Zero glycemic index. Not harmful to teeth. Suitable for diabetics. It is one ofthe cheapest sweeteners. Works very well with other sweeteners including Aspartame and Sucralose. It is heat stable and is suitable for cooking and in processed foods. The main concern seems to be the other sweeteners it is mixed with usually Aspartame. On its own no human side effects have been reported. Unlike Aspartame it is not absorbed into the body. In the small amounts required in the normal diet it should pass through the digestive system without being absorbed, and without effecting the body in any way. Artificial sweeteners are not always effective in reducing weight. A trial, conducted at the Weizmann Institute of Science in Rehovot, Israel and published Sept 17th 2014, may explain the reason. It appears that these sweeteners affect the bacteria in the bowel in adverse ways. Tests showed impaired glucose metabolism in subjects, human and animal following moderate consumption over several weeks. More information is available in Science News. The result may be increased appetite following consumption of artificial sweeteners, and could explain why weight loss is not achieved. Medicine.net report that Ace K contains the carcinogen methylene chloride and that prolonged exposure can lead to a whole host of problems including cancer. The FDA has set a guideline Acceptable Daily Intake of 15 mg of the substance per Kg of body weight. For the average person this would be about 36 cans of soda sweetened with Acesulfame K. So it's very unlikely to consume an excessive amount relative to the guideline. Testing done in the 1970s showed the substance to be safe. However the CPSI has questioned the quality of the research carried out and called for further testing. It has called on the FDA to conduct high-quality, modern-day studies or withdraw its approval of it. In the meantime it has given a red x safety rating key to this product on its website. Acesulfame K is a totally artificial chemical. It is made from a process that combines acetoacetic acid with potassium, to form a crystalline product. Sunett, Sunette and Sweet One. It is not generally sold to the consumer. On the commodity market it is one of the cheapest sweeteners, costing about 4% the price of sugar for the same unit of sweetness. In 2012 it sold approx 1.2 million tonnes equivalent out of a total world market of approx 188 million tonnes. (Sugar was about 155 million tonnes) This would give it about 0.63% of the total market by unit of sweetness. By value it would be significantly less. Although it is commonly used it is not generally known to the average consumer. Like most artificial sweeteners it was discovered by accident. Karl Clauss a chemist in Hoechst was working in a lab when he noticed a sweet taste on a piece of paper he had touched. He realized that a tiny amount of the chemical he was working on had got on his fingers. It was approved by the FDA in 1988, and has been used as a sweetener ever since. 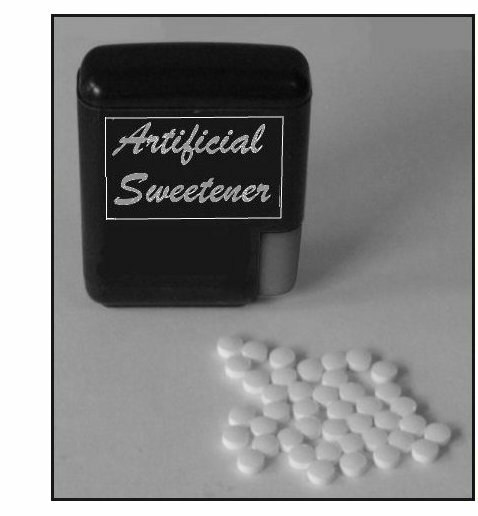 It is also used in a 33% ratio with Aspartame to create a new sweetener called Aspartame-Acesulfame Salt. This is 350 times as sweet as sugar and has its own E number in the EU (E962). Approved in the USA since 1988, GRAS in 2003. Approved in over 100 other countries. Approved in the EU as E950. Acesulfame K is not absorbed by the body and is probably safe in small quantities. It has been used for about 25 years with no side effects reported. Tests on animals also appear to have come up safe. However it is often mixed with Aspartame, which has its own problems. On its own it appears to be fine.